Milk Makeup releases are seriously the best, as the brand’s packaging and product quality is always top notch. And Milk’s latest limited-edition glitter stick release is no exception, especially since it will benefit The Center, an organization that helps, welcomes, and supports the Lesbian, Gay, Bisexual & Transgender Community. Providing health and support services, The Center couldn’t be more than overjoyed about its new partnership with Milk. And what a great way to celebrate Pride month! As Teen Vogue reports that Glennda Testone, Executive Director of The Center feels that the Milk beauty brand has successfully celebrated both individuality and diversity. The Milk team was also more than happy to talk about new collaboration, as Teen Vogue also notes that Milk’s Co-founder Mazdack Rassi created the partnership to honor the amazing things The Center does for the LGBT community. And of course, there’s the drool-worthy product! Milk first teased something sparkly and exciting was coming our way last week, and now that the product is finally here! We can’t say that we are disappointed. Proving to be the sparkle stick of your dreams, the new Glitter Stick highlighter gives your eyes, cheeks, lips, and face a fun rainbow highlight that flatters all skin tones. And like all Milk formulas, this highlighter is formulated with mango butter, coconut oil, and avocado oil to glide like butter onto your skin. 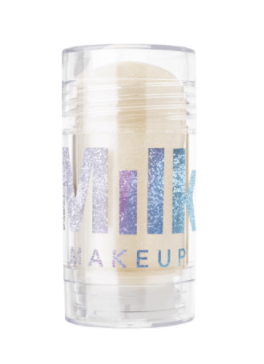 The Milk Makeup Glitter Stick retails for $30 and it’s now available for purchase on the brand’s website. Half of all product proceeds go directly to The Center.